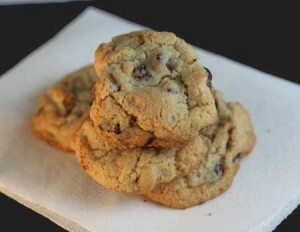 Variation on McCormick's "Vanilla Rich Chocolate Chip Cookies from the back of the vanilla extract box and their ads. Preheat oven to 375°F. Have ready two ungreased baking sheets. Mix flour, baking soda and salt in medium bowl. Set aside. Beat butter and sugars in large bowl with electric mixer on medium speed until light and fluffy. Add egg and vanilla; mix well. Gradually stir in flour mixture on low speed until well mixed. Stir in chocolate chips and walnuts. Drop by rounded tablespoons about 2 inches apart onto the baking sheets and bake for 10-12 minutes or until lightly browned. Cool on baking sheets 1 minute. Remove to wire racks; cool completely.